Steeped in history, the Buffalo Hotel is the oldest hotel in Mpumalanga’s “Wild Frontier” tourist region. It has always been a landmark in the Lowveld. It is located on the corner of First & Torchwood Streets in Hectorspruit, exactly 1 km from the N4 after the Hectorspruit turn-off is taken. Hectorspruit, between Malelane and Komatipoort, is 95 km from Maputo in Mozambique and 110 km from Mbombela (Nelspruit). We are therefore an ideal weekend getaway for city dwellers from the Maputo and the Mbombela areas. The Hotel was originally established in1923. It is a national and internationally renowned holiday, conference and event destination. 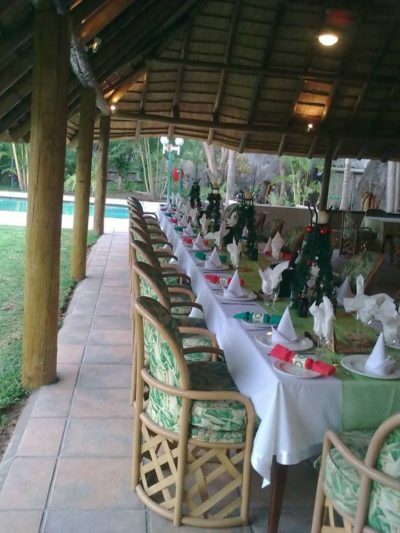 It is ideally situated for business travelers, particularly those with projects in Mozambique or the Lowveld. Our mission is to provide affordable, luxury accommodation and entertainment at competitive prices. We enrich the quality of life and spoil our guests beyond their expectations. This is supported by our ala carte restaurant, conference facilities, fabulous lapa, swimming pool and related conveniences. We are well positioned to provide access to the Kruger Park. Jumping castle and games available for kids entertainment. The world famous original Buffalo Bar with its record trophy (from which the hotel’s name is derived), is a famous landmark in the Lowveld. It also features a sports bar with large flat screen TVs and an adjoining veranda with pool tables and dart boards. A dedicated bar menu is available to satisfy all appetite requirements of thirsty visitors at anytime of the day. Our affordable en-suite double bedrooms are tastefully decorated, all have air conditioning, satellite tv and tea/coffee making facilities for our guests’ comfort, but please note the Buffalo Hotel has NO self catering facilities. To round off a perfect day, relax in the secure gardens at the pool or enjoy a cocktail at the Lapa overlooking the swimming pool. We also offer a unique venue for elite banqueting and wedding events. Ample and safe parking is provided. The spacious hectare sized premises is surrounded by an electrified fence. The secure parking area is ideal for towing and loaded 4X4 vehicles with boats, trailers, campers, caravans, etc. Holiday guests on their way, or coming from Mozambique are specifically catered for.